This week, Your News to Know brings you the top news stories involving gold and the overall economy. Stories include: Gold rises along with geopolitical risks, Bloomberg Intelligence weighs in on the race between gold and the S&P 500, and gold prices could soon reach $1,400 due to peaking output. 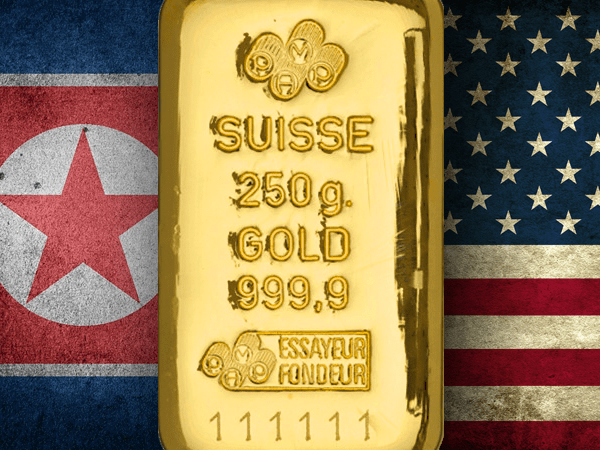 Gold prices rose once again as the situation between the U.S. and North Korea escalates further. The conflict with the Asian nation has been a major force behind gold’s rally and has helped the metal breach the $1,360 mark, its highest level in over a year. Recent statements by North Korean Foreign Minister Ri Yong Ho showed that the U.S.-North Korea feud may just be getting started. In his speech to the UN, Ri said President Trump declared war on North Korea, giving the latter the right to take countermeasures which include shooting down U.S. bombers. Ri’s statements come after Trump’s vows to destroy North Korea unless Pyongyang ceases its nuclear threat towards the U.S.
Gold and the S&P 500 appear to be in a tight race, with both markets experiencing a gain of over 20% since the beginning of the Federal Reserve’s tightening cycle back in December 2015. Bloomberg Intelligence analyst Mike McGlone, however, says that the battle favors gold. McGlone is particularly impressed by gold’s ability to go toe-to-toe with stocks despite the S&P 500 soaring higher than ever. “With the record-setting stock market barely beating gold, the metal may be worthy of greater attention,” he said, listing brewing inflation, a potential dollar peak and the lowest CBOE Volatility Index ever as more reasons why gold stands to reach historical highs. Not to mention higher stocks would increase reversion risks, further supporting the metal. The world may have already produced the most annual gold possible, which could give rise to higher prices. This is according to World Gold Council chairman Randall Oliphant, who believes prices could hit $1,400 an ounce in the next 12 months, aided by geopolitical risks. Other attendees at the 28th annual Denver Gold Forum made similar comments in regards to gold’s production. David Harquail, chief executive officer of Franco-Nevada Corp, stated that the gold industry is in an ex-growth phase where new mining projects are simply replacing old assets. “We’re not going to fall off a cliff in the near term, but in the same time it’s really hard to see how we’re going to produce enough gold to meet all this demand,” said the WGC chairman, who sees gold potentially reaching record highs in the medium term.